Our kraft board platters come in two sizes, both with a nice big clear window made from plant-based PLA. 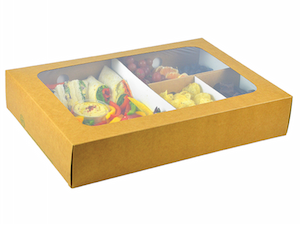 Very stylish, and completely compostable - perfect for catering for eco-conscious companies and events. Ideal for cold foods such as sandwiches or chocolate brownies. The crash-lock inner drawer comes with it in the case. And then to divide the platter into different areas, choose to add in our quarter, half or eighth inserts.They're super easy to assemble and ideal for separating sweet and savoury, veggie and meat.